Tundra and Trumpeter Swans | Flickr – Photo Sharing! In the interest of improving my ID skills I’ve been studying these two nearly identical species. Both can be found in Washington in winter in large mixed groups, particularly in the Skagit Valley. I do see them in the Puyallup Valley regularly in smaller groups, but are often in locations that are distant from public rights of way (right of ways?). 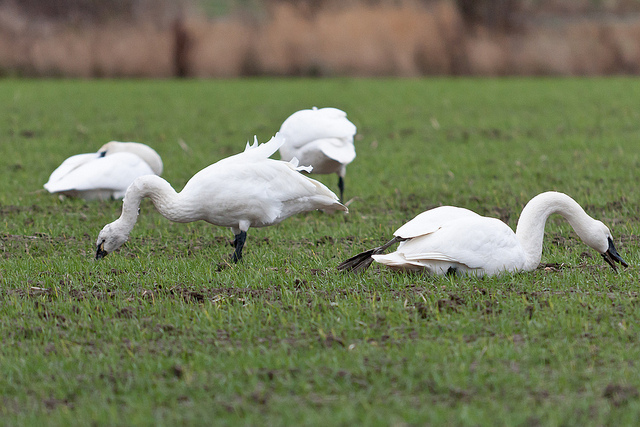 The main difference between the species is size, with the Tundra Swan being a foot or more shorter from beak to tail. That can be difficult to discern in the field unless the birds are side by side in the same pose. Another difference is the bills. Most Tundra Swans have at least a small yellow patch on their bill close to the eyes. The problem is that a significant number, ~10%, lack that feature. In addition, a small number of Trumpeter Swans have a similar light area on their bills. I recently read a piece about how to identify these birds on David Sibley’s blog. Shape of the bill plays a big part in separating the two species. The biggest take away I got from his article is that the Tundra Swan’s eye is more defined because of the way the black of the bill narrows near its eyes. The Trumpeter’s eye appears to blend into the bill. I guess even more important is to look at the whole bird and note as many details as you can see. But none of that can dampen the enjoyment of seeing such magnificent creatures in the wild. Tundra and Trumpeter Swans | Flickr – Photo Sharing!. Over the past several days our yard and neighborhood have been rich with a variety of birds. Many of the birds seem to be finding relatively natural sources of food. I currently only have one hummingbird feeder and a suet feeder stocked. Among the birds I’ve seen include many Dark-eyed Juncos and American Robins, roving flocks of Bushtits, a few American Goldfinches and Pine Siskins, and a couple of Western Scrub Jays. The Goldfinches and Juncos seem to be interested in seeds from last summer’s flowers. At least one Robin was gleaning berries from a juniper. The Bushtits work the trees and shrubs and mob the suet feeder. Two or more Anna’s Hummingbirds jockey for control of the feeder. I had a little extra time this morning and took my camera and binoculars out looking for Trumpeter Swans. We often have a few in the valley this time of year, but it’s hit or miss. I drove out along Pioneer Way, River Road, Stewart, 66th Avenue, and Gay Road. 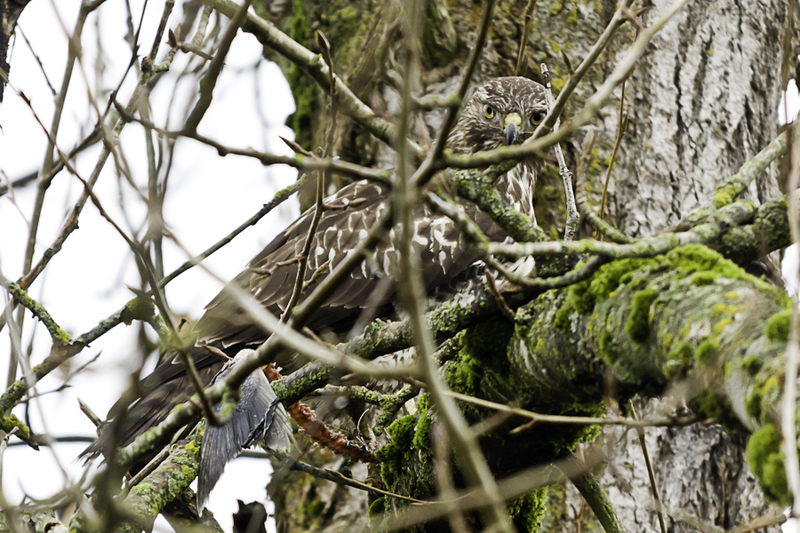 I was striking out early, but chanced upon a Red-tailed Hawk fairly low in a tree along Gay Road. It stayed put when I stopped and rolled down the window. As I got my camera up and ready, I noticed it was eating something. I started snapping a few pictures and noticed that part of the hawk’s meal was dangling from the branch. I focused on that and saw that it was a fish head! Then I saw the tail on the other side of the branch attached to a spine that had been picked pretty clean. I’ve never heard that Red-tails are adept fishers, but maybe they are. More likely though is it found a carcass that had been abandoned and took it to a nearby tree for an easy meal. After attracting the attention of a nervous resident in an Army Ranger jacket, I decided to move on rather than tempt fate. Continuing back onto River Road then back over to Pioneer, I noticed a group of large white birds in the distance from 52nd Street. With my binoculars I confirmed a flock of about twenty swans too distant to photograph or sort out species, but I would guess the majority would be Trumpeters. Like in past years, they congregated near the railroad tracks that parallel Pioneer. The elevated road bed for the tracks make it so they are not visible along most of Pioneer, and where they are visible it is only a peek-a-boo view. I drove back onto 66th, and stopped at the Pierce Conservation District office. I asked if they had a view of the field in question. Mike Baden of the PCD accompanied me out to the back of the facility and told me the extent of their property. He then left me to it and I proceeded to walk along a fence row hoping to find an open view. Once again I got just peek-a-boo views of the swans, and finally had to turn around as the soil in the field got softer and softer. Shoulda worn boots! Certain places have importance in our lives and families. I’m sure that, given enough time, I could list dozens of places the mention of whose names could make me smile, or maybe even tear up. But I’ll try to keep the list under control. I’ll start with Sunrise in Mount Rainier National Park. From the late 1960s through most of the 1970s, and a few times since, my family would make the long trek from the suburbs of Seattle to the highest point accessible by car in the park. In large part, this was driven by my grandmother, a Norwegian immigrant. We tried to time these trips to coincide with the peak of wildflower season, because it reminded grandma of her childhood in Norway. My mom also loved Sunrise for its flowers. It is no coincidence that the second place on my short list is also a national park. Dad was very drawn to them but tended to avoid the highly popular ones like Yellowstone or Yosemite. Big Bend National Park in west Texas is one of the least-visited national parks, most likely due to its remote location. Named for the “big bend” of the Rio Grande River along the border with Mexico, it is mostly desert. It also features the Chisos Mountains, the only range located entirely within the boundaries of one national park. We visited Big Bend a number of times when the Army posted dad in Texas. He really loved it there. Laurie and I returned about seven years ago and found it remarkably unchanged after 40 years. A place that evokes mixed feelings is also in Texas. For about a year, we lived in Galveston, literally across the street from the Gulf of Mexico. My dad had been appointed the district engineer for the Corps of Engineers. I was just 4 years old at the time, but I remember thinking it was pretty neat to have a beach so close at hand. In September 1961, our family was part of what was then the largest peacetime evacuation in our nation’s history. More than half a million people left low-lying coastal areas to flee inland from Hurricane Carla, now described as the most severe hurricane to make landfall in the United States. My sister’s school, Ursuline Academy, was destroyed by a tornado spawned in the storm. Also destroyed in Galveston was dad’s chance of promotion to general due to a principled stand he took against a proposed Corps of Engineers project. A decade later, the project was the subject of a lawsuit brought under the National Environmental Protection Act. A reporter from the Houston Post was very interested in dad’s perspective. I think of these places, and many others, often. At times, I wish I could rewind my life and relive the experiences I so treasure. But I’d have to take the bad with the good, and that I can do without. The following was originally published in the Puyallup Herald. Did you catch PK Dwyer’s show recently at the Puyallup Farmer’s Market? I didn’t. Had I known he was performing, I’d have been there. Once, when I was working at a fast food place in college, Dwyer and the other Jitters walked in and ordered some road food. He wore sunglasses, and if I recall correctly, jeans and a sport coat. But what made him memorable was his hair. It was light-brown or blonde hair, styled in a sort of unruly shag-do, his head nearly disappearing in its immensity. Dwyer has been making music on his own terms for decades, preferring to perform on the street or in small, unique venues. His occasional recordings have garnered great reviews and an award or two. Oh, and nowadays that immense hair has migrated south to his chin, where he sports a Meeker-esque beard. But he wasn’t the only northwest musician I’ve been catching up with in the past couple of years. 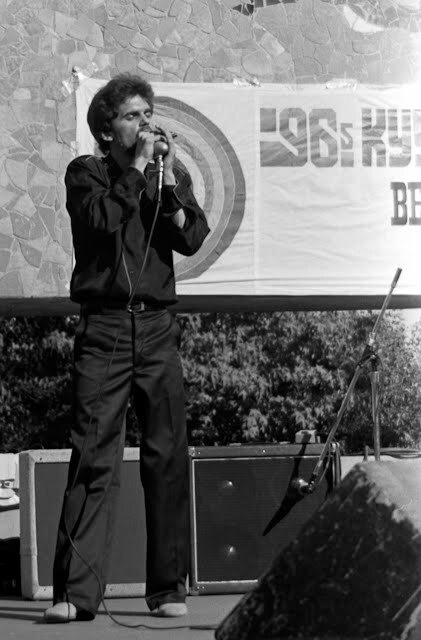 While digitizing some old negatives I shot at Bumbershoot, I wondered about the subjects of those pictures, a blues outfit called The Slamhound Hunters. With a little research I found out the harmonica player and lead vocalist, Kim Field, now fronts The Mighty Titans of Tone in Seattle, and published a terrific book on the history of the harmonica. Then, while browsing Facebook looking for Field, I came across a duo known as Funk Mason. Carl Funk and Larry Mason had been key members of The Allies, one of the most successful Seattle bands of the 1980s, gaining national exposure on MTV’s Basement Tapes. After spending some time in New York, both came back to Washington. For ten years or so they played regionally as an acoustic duo. A little more than a year ago they teamed with local boy and Grammy winner Eric Tingstad to form The Halyards. 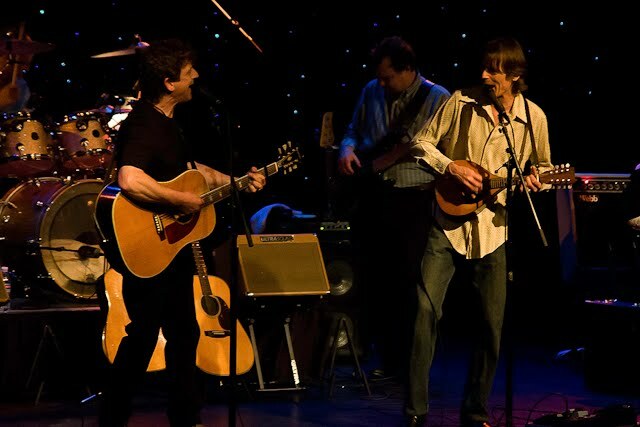 They released a well-received CD, “Fortune Smiles,” and have been performing regularly in the Puget Sound region. At the U2 show at Qwest Field recently, I had my wife Laurie take a picture of me proudly displaying my Halyards t-shirt, with the gigantic stage in the background. U2 was an almost overwhelming experience, with the high tech audio-visuals and crowd of 70,000 roaring for the biggest rock band in the world. But the importance of musicians like Dwyer, Field, Funk, and Mason looms large in my life, pushing the megastars down the list of music I can’t live without. Lesson learned: Check the Puyallup concert listings regularly. In recent weeks there have been two stories in the papers about wildlife threats to pets. One was local, the other from another part of the country. The wildlife in one story was coyotes, in the other, raccoons. In both stories, family pets had been killed and badly wounded in encounters with these animals. In both stories there was much hand-wringing about how to protect pets and children from marauding predators. I have a plan for people concerned about the safety of family and beloved household companions. First, do not let your small children or pets outside unsupervised. Never allow pets to just roam the neighborhood. Second, do not leave food for pets outside. It will attract the aforementioned animals, not to mention rats, opossums, et al. Third, keep your garbage in a tightly closed container in a secure location. Fourth, if you feed birds, set your feeders up in such a way as to be inaccessible to undesirable wildlife. There are many clever devices on the market to assist you. Clean up beneath your feeders regularly. As to my first point, it is especially common for cats to be allowed to roam. There are many problems with this. Not only are cats easy prey for predatory wildlife, if they happen upon a cat-hating dog the result could be the same. A fight with another cat can end badly as well. How often have you seen a dead cat by the side of the road? I don’t think many of them died from natural causes. Also, I hope you keep your cuddly kitty up to date on vaccinations for those random encounters with other domestic felines, or worse, feral cats. So far, I’ve only mentioned the dangers to cats roaming, but there are other problems. About twenty years ago I acquired a beautiful male grey tabby cat. He was a stray, brought home by my then roommate. At the time he was my only model for cat care, and he always let his cats roam. So I let Billy roam. I thought, “This is great! He barely ever uses the litter box.” What I didn’t really think about was what he wasusing. The neighbor’s flower bed, or a child’s sandbox for example. I imagine he found all sorts of wonderful scratching posts around the neighborhood as well. Years later, when a landlord told me Billy would need to be kept inside, I was unhappy about the inconvenience, but I eventually learned that it was for his own welfare, and I had been selfish by letting him roam free. A smart veterinarian would tell you the same thing. Then there is the damage they do to native songbirds and small mammals, such as rabbits and squirrels. Domestic cats stalk these animals not because they need to eat, but because it is their instinct to do so. So, well fed, pampered pets hunt down and kill wild birds that are just trying to survive and feed their young. Millions of them die this way every year. 8.12.020 Impounding authority – Care. In the end I have just this to say: Take care of your pets. Be responsible and protect them. I will feel sorry if I hear that your dog or cat died in some horrible and unnecessary way, but you, the pet owner, will get little sympathy from me.